To sign up for email updates click here. Despite the recent rain, Margaret Park site construction has been progressing quickly and is expected to wrap up in the coming weeks. Once the park has re-opened, many of the newly re-seeded areas will remain fenced through September to ensure proper turf establishment. During this time, we ask that park users try to avoid these areas whenever possible. 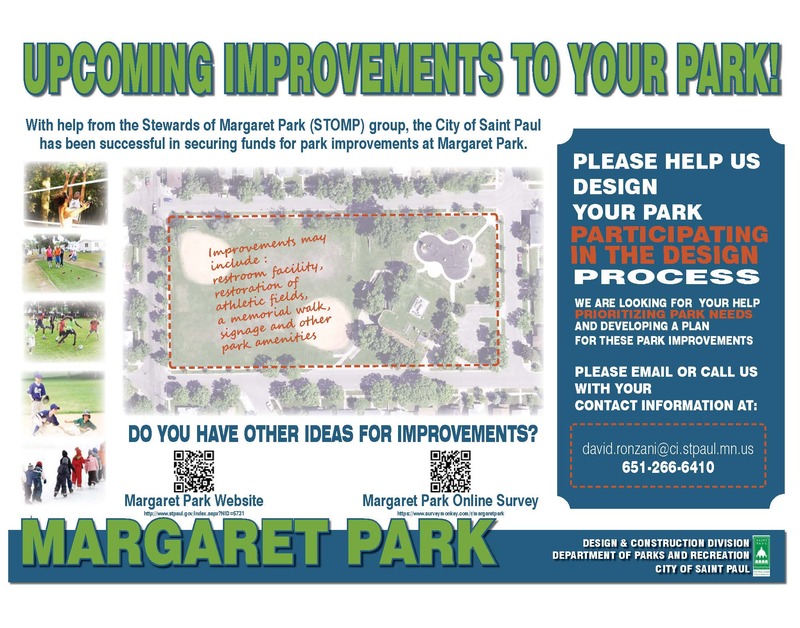 Saint Paul Parks and Recreation staff held three informational sessions to gather community feedback prior to the start of Margaret Park Design Process. These sessions included two Pop-Up Community Meetings (in conjunction with previously scheduled events) at Margaret Park for the upcoming park improvements project, and an appearance at the Duluth and Case Family Fun Night. During these events, staff encouraged members of the community to stop by our table to let us know how we can improve Margaret Park to best meet the needs of your neighborhood.